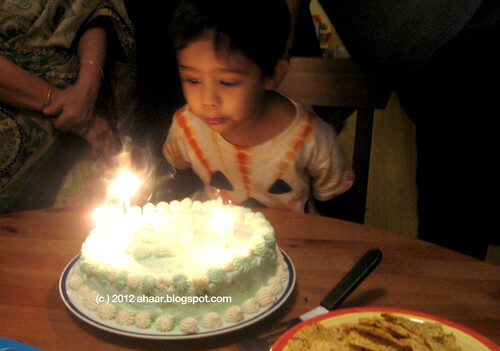 It was Aswin's birthday last week and this time we made a mixed berry cake with whipped cream topping. Lil A is not so fond of cakes, but he does like to lick all the cream off the cake or cupcakes. So when he demanded a blue or green cream topping, I knew he was serious. I chose a simple mixed berry cake from Smitten Kitchen and then tweaked it. Whole wheat flour to replace all purpose flour, no lemon zest and glaze either, instead sinful whipped cream that Lil A helped stir and decorate with. I also made fresh buttermilk with homemade yogurt and since I had no fresh berries, used couple of cups of frozen berried from a mixed berry bag. The cake came out delicious and was enjoyed by friends who had dropped by to wish Aswin. And as you can see, it was Lil A who was so excited and even helped his dad blow out the candles. 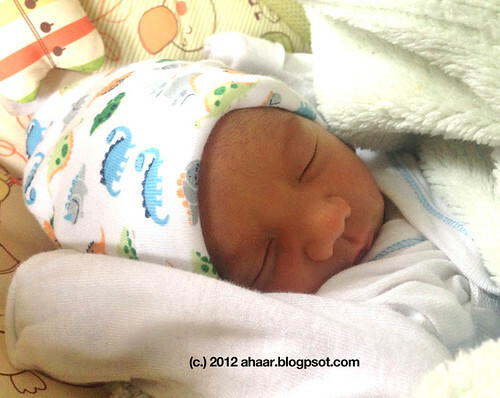 Tiny M on the other hand, was content in the arms of his parents, aaji and aunts and uncles. It was a busy evening and I forgot to take a picture of the slice of the cake. 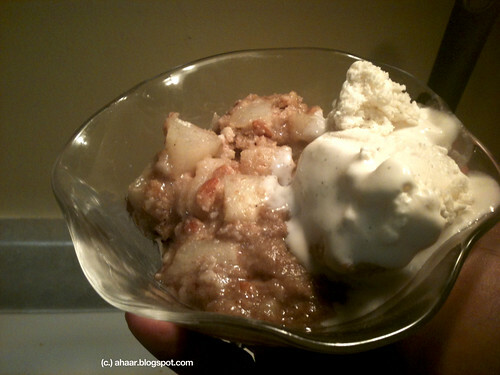 I am sure to make this again and will take a picture then and update the blog. Preheat your oven to 350°F. Generously grease cake pan with butter and sprinkle flour on top. Set aside. 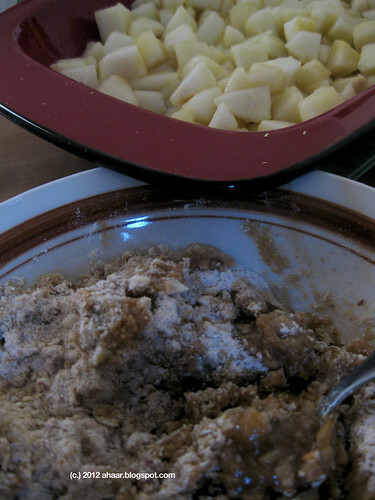 In a medium bowl, sift the flour (leaving out the 2 tbspoons), with baking powder and salt. Now, in a separate bowl, cream together butter and sugar continuously for 5 minutes till it is fluffy and lighter in color. Then, add eggs one at a time. Then add the vanilla extract. Now is the time to add the flour to the mix. Instead of adding it all together, add little bit at a time followed by buttermilk. Also be careful as the batter will be quite thick. Add the frozen berried in a bowl and add the flour. It helps them from sinking to the bottom. 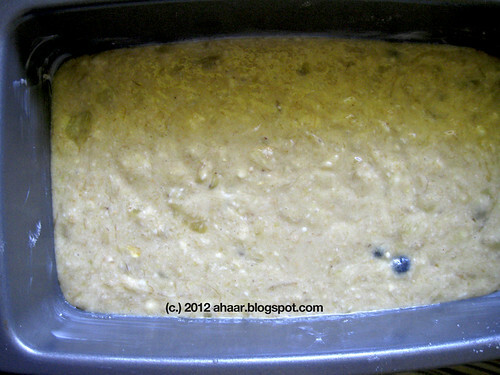 Once the batter is done, gently add the berries into the cake batter. The batter will be very thick and this will seem impossible without squishing the berries a little. Bake for 45-50 minutes, rotating the cake half-way through. Check with a toothpick. Now for the whipping cream, beat the sugar, heavy cream and color together till stiff peaks form. 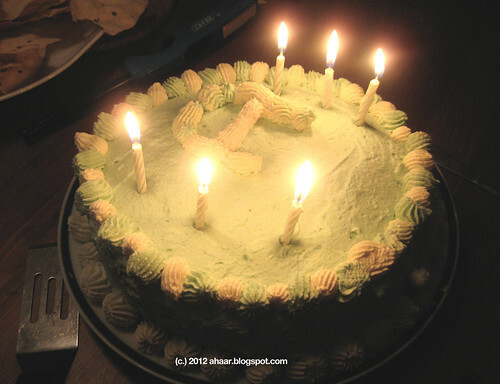 Add it smoothly over the cake and decorate it in any way. Cool till ready to serve. with the addition of a new member - Manan. Unlike Lil A, Tiny M is loud. When we went to the pediatrician, she commented "he has to be heard over his brother, so he's already practicing." My MIL is here helping us as we all realign ourselves. As for this blog space, it's an important part of my life and I don't intend to neglect it completely. I will be posting as and when I get a chance. Hope your Diwali is full of joy and happiness too. 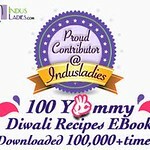 I very grateful for the love and good wishes that I get from my blogging friends readers. Thank you! My pregnancy brain has taken over, I'm sure! I'm told that in the last month or so, "nesting" kicks in. And here I am, instead of getting stuff ready for the new arrival in my "nesting" phase, I am standing near a stove, stirring and making kalakand from scratch at night after Lil A went to bed. What else would you call it? I didn't start out wanting to make it from scratch. 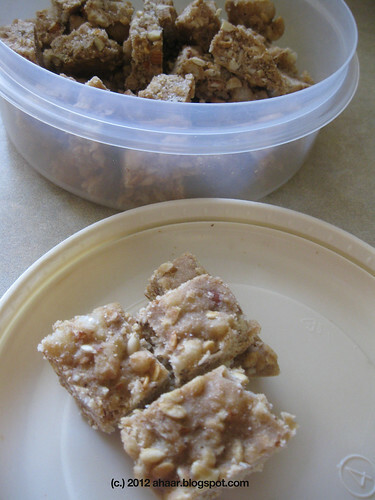 I was supposed to make Bong Mom's microwave kalakand recipe. But when it was time, I realized that I didn't have even one ingredient from her recipe. So I set about making paneer/chana and then kalakand from scratch. The kalakand was just out of this world. I cannot imagine I've not made it in before this. 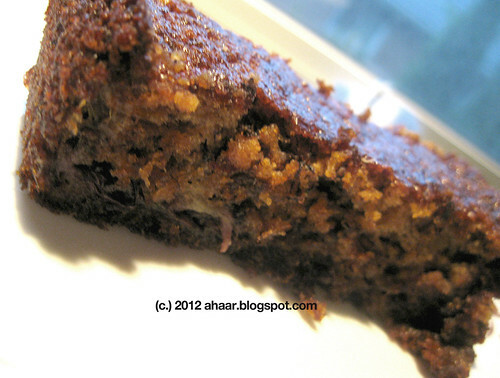 The soft, crumbly, grainy texture with the cardamom and saffron taste and the gentle sweetness just blew me away. I am sure to make it again and again. 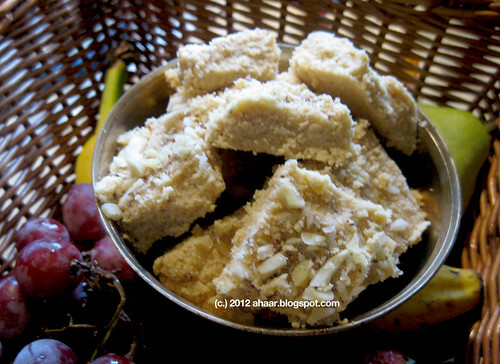 So with this delicious sweet I wish you all "Shubho Bijoya". Making paneer/chana: Heat the milk in a thick bottomed pan and bring it to a boil. Once it starts boiling, add the lemon juice till the milk separates. Immediately strain it and tie the paneer/chana in a cheese cloth and let it hang for an hour till excess water drains. 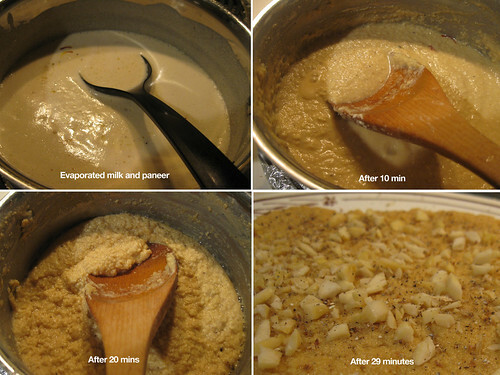 Making Kalakand: Mix 1:1 ratio of evaporated milk and paneer in a thick bottomed pan. I got about 2 cups of paneer/chana and took 2 cups of evaporated milk from the can. Heat the pan with ghee and then add the paneer and evaporated milk. 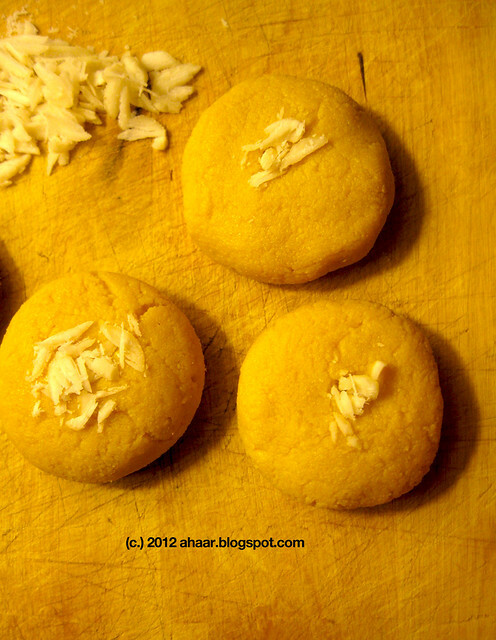 Add the saffron strands and half the cardamom powder. Keep stirring the mix on low medium heat till the mix starts to thicken. Then add the sugar and keep stirring till it becomes a soft dough consistency and starts leaving the pan. It took me about 29 minutes to reach that consistency. Spread it on a plate and spread the rest of the cardamom powder and almond bits and cool overnight. I was so excited when I saw mocha or banana flower in the Indian store recently. (Mocha is pronounced as Mo cha as in chair). It's been many years since I had one and in my mind the process of cleaning is complicated, one I have never attempted. I do remember my mother sitting with a boti and a newspaper in the kitchen, patiently rubbing her hands with oil and cleaning the flower and chopping it for ghonto. My mother-in-law is visiting, and I was confident that between the two of us we will be able to tackle the cleaning. I called my parents to ask about ghonto recipe and for tips. 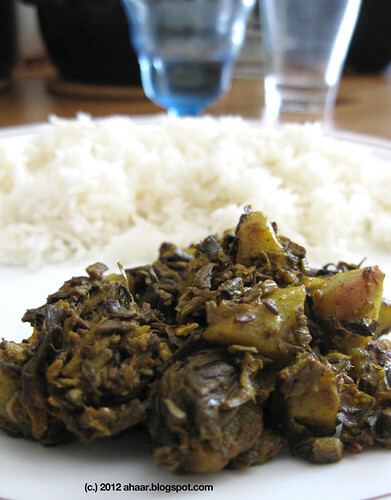 As soon as I told them about the banana flower, my father gave me the recipe for mocha ghonto. All the tips came from my mother "soak the banana flower in turmeric water", "take out the stamen" "rub oil in your hands" etc. 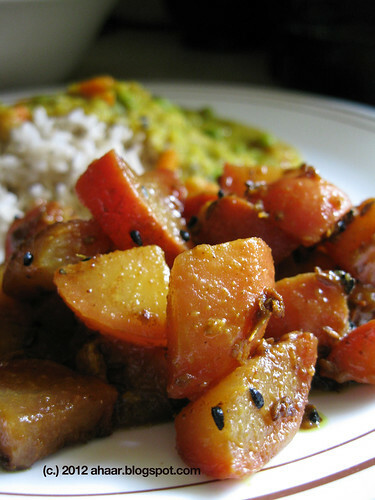 I added some potatoes to the ghonto, and you can add some coconut, shrimp or even chana dal to mochar ghonto. 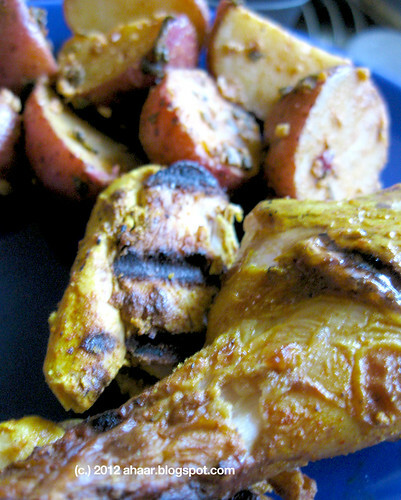 The end result was delicious, we had it with friends over lunch and it was gone in no time. We were so inspired with our success that we got another banana flower and my MIL gave me another recipe which is coming up in the next post. With this mochar ghonto, I want to wish all of you a wonderful Durga Pujo season. Rub your hands with oil, then open the outer layer of banana blossom, take out the flower one by one and remove the stamen and chop it finely. Follow the same pattern for the other layer of blossom, until you reach the central heart, which is slightly pale yellow or off white in color. Chop it finely, you will notice some stickiness and this is where the oil will come in handy. 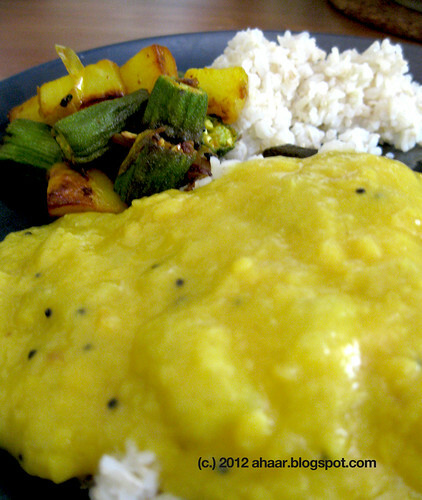 Then heat some water, add 1/2 tspoon turmeric powder soak the banana flower and leave it for 5-6 hours. 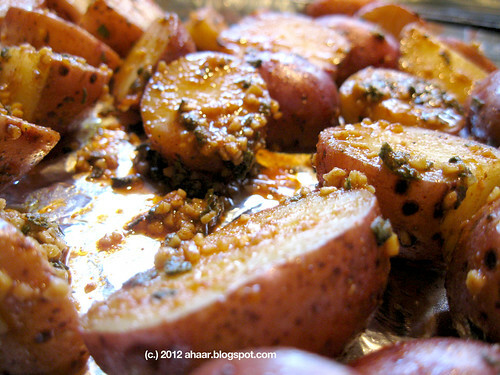 Heat up a deep pan, add half of the oil and saute the potatoes for 2-3 minutes. Take them out and set it aside. 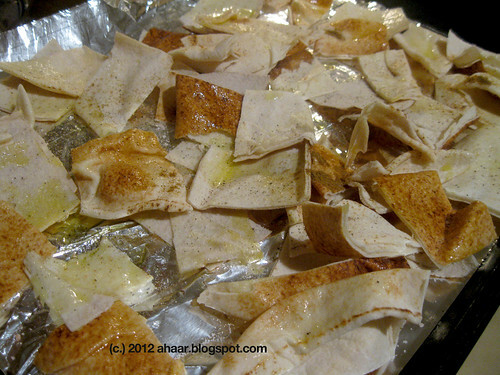 Now add the rest of the oil and temper it with cumin seeds, bay leaves, cloves, cardamom and cinnamon. Then add turmeric powder, chilli powder, coriander and cumin powder. Take the chopped mocha out of the water, squeeze it nicely and add it to the pan. Saute it all together for 2-3 minutes. Sprinkle little water and cover it and cook it for 3-4 minutes on low medium heat. Add the salt and sugar and the potatoes and let it cook for another 4-5 minutes. Keep mashing the mocha with the wooden spatula to mix it together. 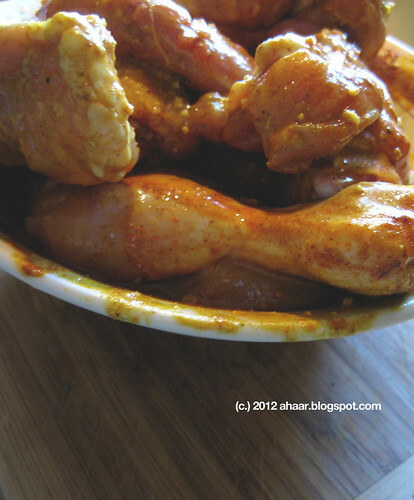 When it's ready, add the ghee, cook for another minute and take it off the heat. Serve hot with rice. The Farmer's Market in Ann Arbor is in full swing. All kinds of vegetables, flowers, plants, fruits are available now. If you go to the market Saturday morning, it is packed with people and kids. Little kids on feet, in strollers, babies with their eyes wide open in wonderment looking at the crowd and the colorful display. Lil A loves going to the market as well. He refuses to sit in his stroller nowadays and walks around looking at each vendor. His favorite is the blueberries stall which has several small ducks perched on top of the blueberries. And nothing beats the apple cider either! At one time, I think, he had a few samples of the cider, before we bought him a pack. This past weekend we picked up a couple of bags full of vegetables. In it was a big bunch of red radish. One bite into the succulent radish and I ate a few more with just salt and pepper. 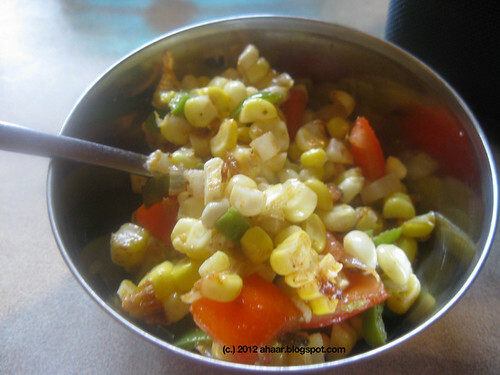 The rest I made into a simple stir fry with panch phoron (Bengali five-spice). Keeping it mild and simple really let the flavors of the radish shine. 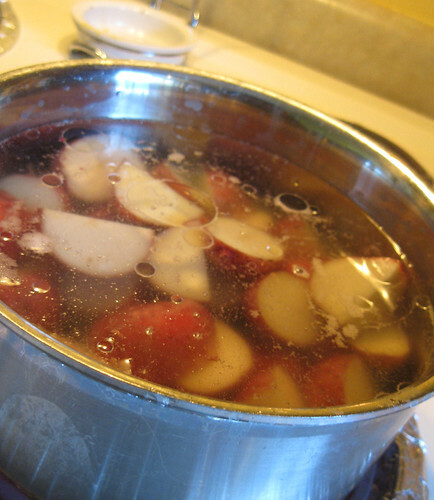 Wash and quarter the radishes. Set it aside. In a pan heat oil and then add the panch phoron and the green chillies. Once they sizzle add in the grated ginger, and tumeric powder. Let it cook for 2-3 minutes. Then add in salt and cumin powder and maybe a little bit water and let it cook for another 4-5 minutes (closed lid on medium heat) till the radish is soft. 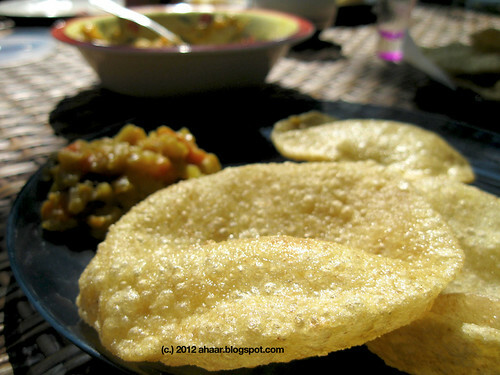 Take it off the heat and serve with rice or roti. 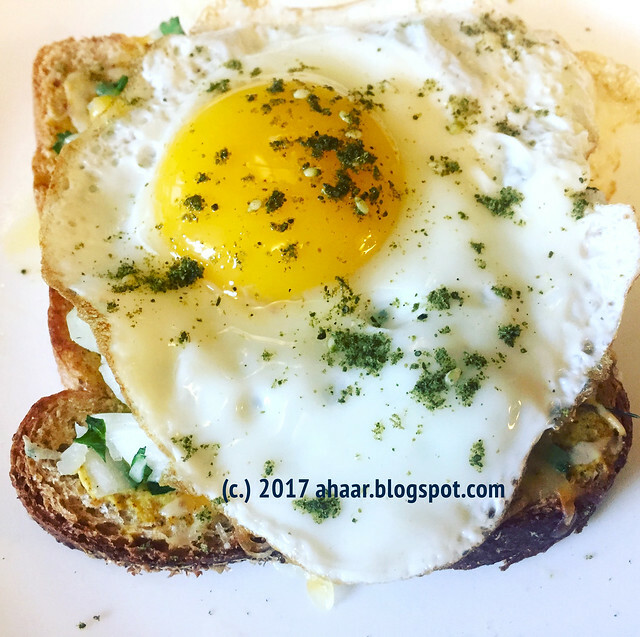 It inevitably happens when my parents come and go or when my MIL is visiting us, the blog reflects that shift with the recipes that are posted. After all this is a place to record our home cooked food. Sometimes I go back in history to browse (doesn't happen that frequently now what with the little one) and it's so interesting to see what was cooking in the kitchen the same month in different years and so on. 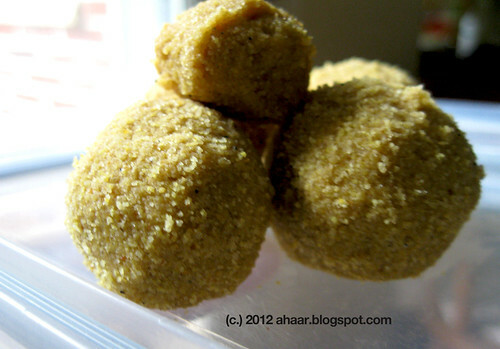 This Moong Dal Laddoo is a traditional offering in my Mother-in-Law's household for Janamasthami. So we decided to make it this year with her help. It wouldn't have happened if she was not here or if she didn't suggest it. 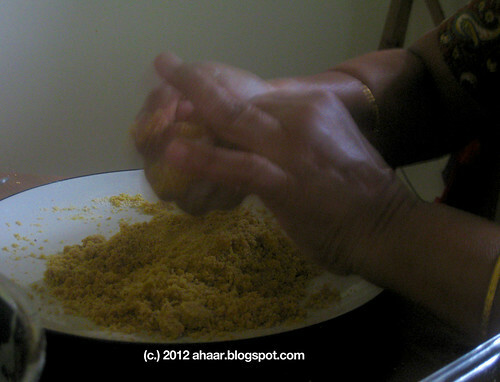 It needs a little bit of prep with roasting the moong dal and then grinding it to a powder. But you won't regret the time spent as the sweet delicacy sits in your palm ready to eat. 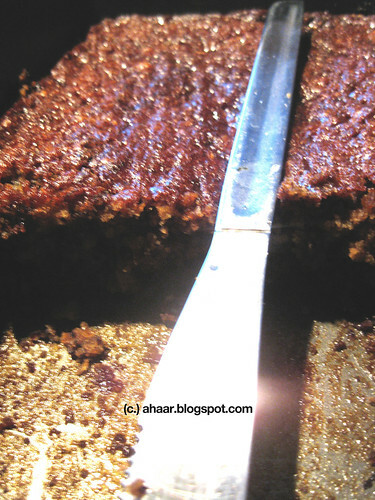 Making sweets or desserts from moong dal is not something we did often growing up. 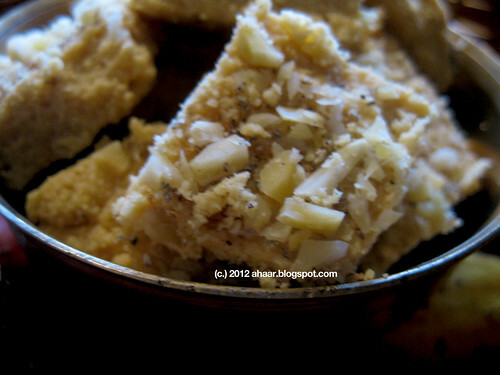 But I would look forward to the moong dal halwa which our neighbors sent over every diwali. 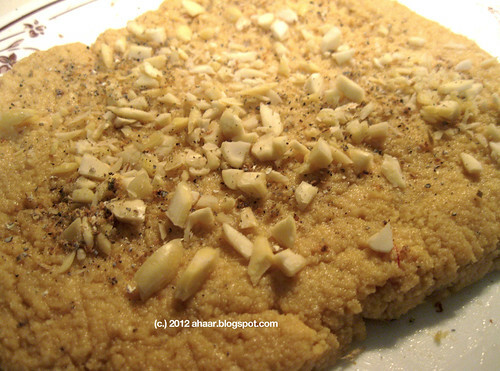 The halwa would be full of ghee and nuts and we would all devour it after lighting the crackers. 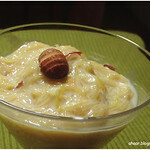 Other than that, this is the other dal sweet which I came across. 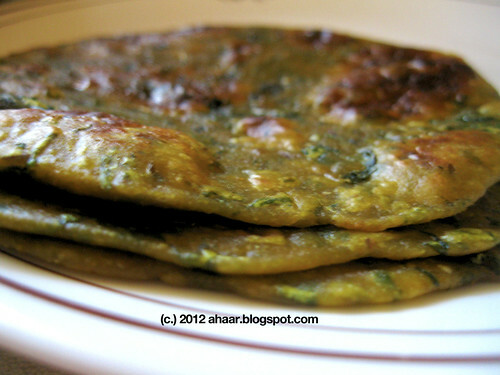 How else could you make a dessert/sweet with moong dal? Dry roast the moong dal until it turns dark golden and gives a strong aroma. 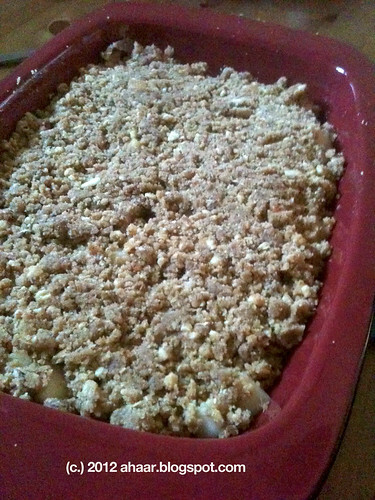 Remove from heat and keep it aside to cool. 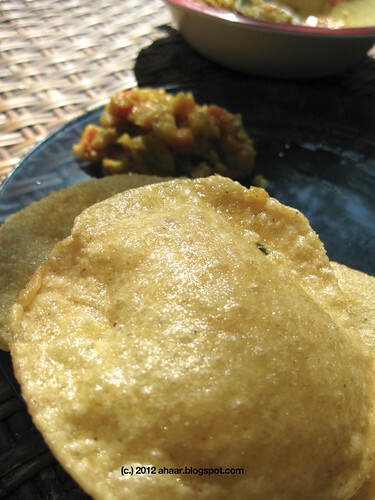 Grind the roasted moong dal into a powder with the sugar and keep it aside. 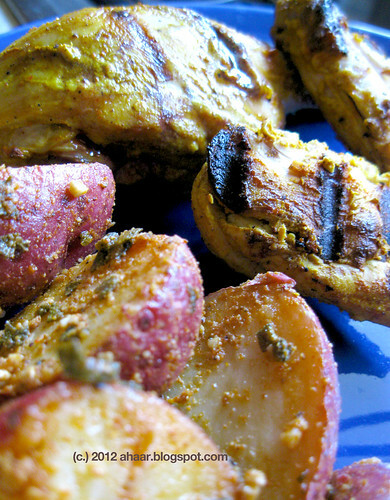 Add the cardamom powder to the mix. 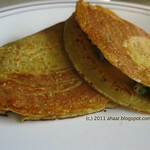 Now heat a thick bottomed pan and melt the ghee. 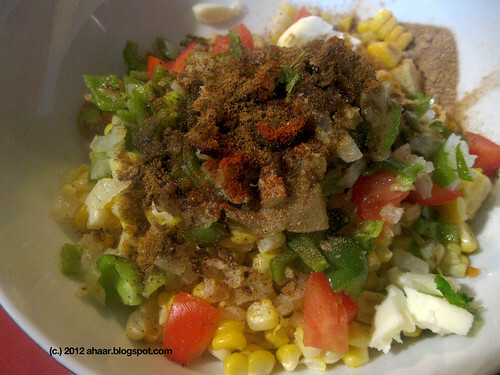 Add all the ingredients and let it cook for 3-4 minute on medium low heat. Take it off the heat and then divide the mix into equal portions and make then into round balls with firm finger pressure. 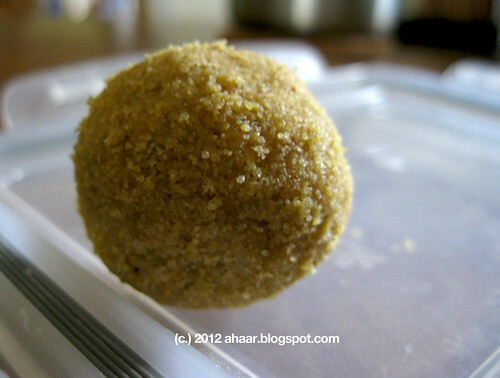 This stays for up to 2 weeks but there's nothing like a good warm laddoo. Summer is going too fast. As I type this rain is steadily falling, the temperatures have dipped to 70s, and I am warming my hands on a hot cup of tea. Lil A is sitting next to me (barely) complaining that his wagon is "all wet" and is demanding to go outside immediately. 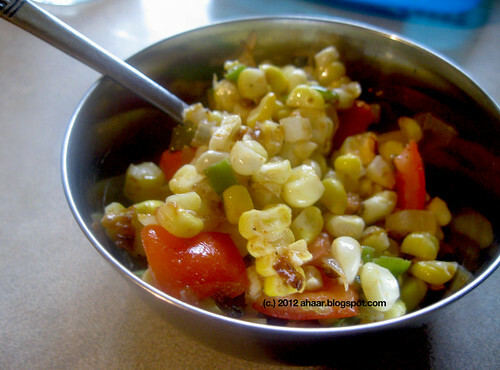 The relief from heat is much needed but I am reminiscing about the hot summer afternoon when I came home to find a big bowl of toker dal. I had been telling my parents about toker dal and that I haven't had it in forever, and also that I need to make it soon. After that I forgot all about it. 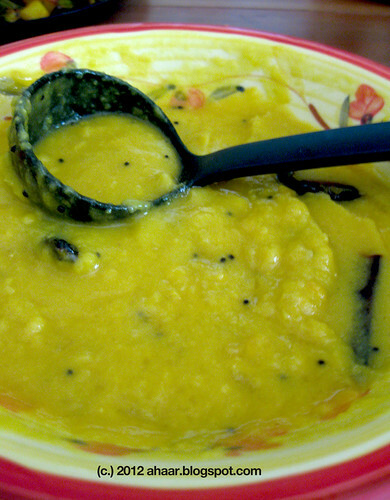 Then I come home one day to find this hot, mildly sour, little bit sweet bowl of dal waiting for me. 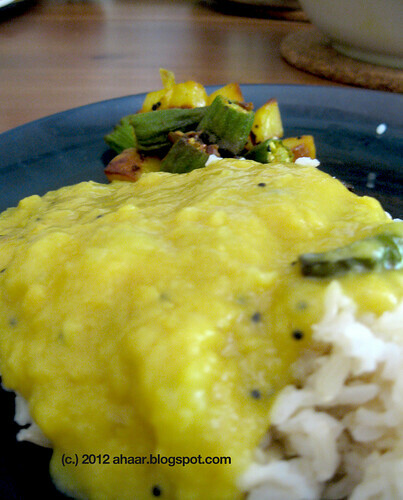 I probably ate all my lunch with this dal that afternoon. This dal reminds me of hot summers and summer vacations in India when we would have this with coolers running and fans whirring. What do you associate with hot summer afternoons? 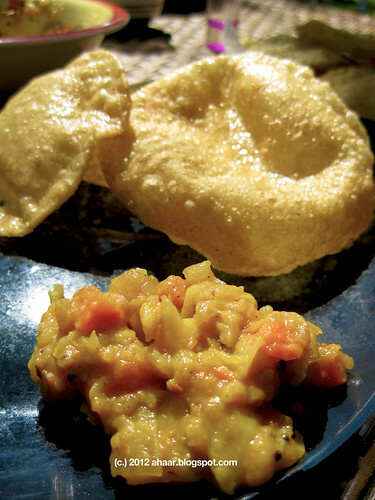 Boil the dal with salt and turmeric powder and set it aside. My masoor dal is done in a pressure cooker in 2 whistles. Set it aside. 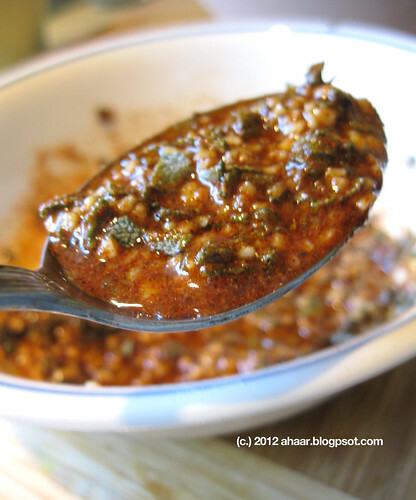 In a deep pan, heat the oil and add hing, mustard seeds and red chillies. Then add the chopped mango pieces and stir for 2-3 minutes. Add the boiled dal, a cup of water if need and let it boil on low medium heat for 4-6 minutes till the mango pieces are soft. Add the sugar, adjust salt and take it off the heat. 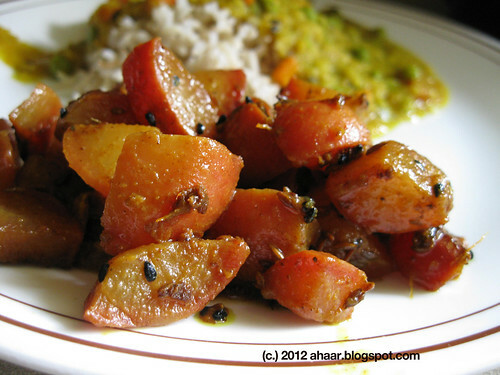 Serve it with hot rice and bhaja (fries) of your choice. 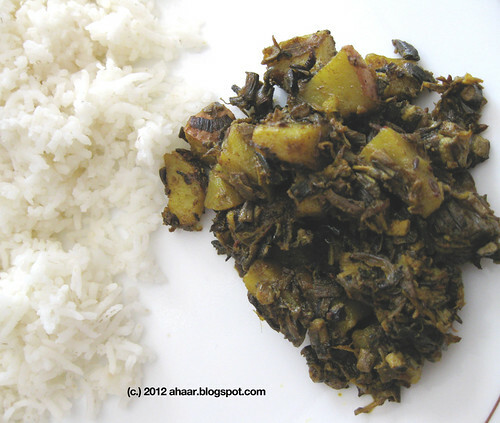 We had ours with some bhindi aar aloo bhaja (okra and potato fries). My sister-in-law in Naperville is an avid gardener. For the last several years, she rents a community plot every summer and grows all kinds of vegetables and fruits that last her well into the winter. 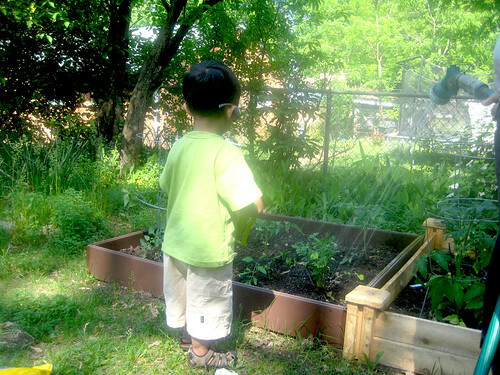 I've blogged about her garden before. When we visited her a couple of weeks ago, she was having a bounty of Kale and gave us a bunch as well. I made some into Kale Chips and still had a small batch left over. After debating about what to try next with the leftover Kale, I decided to try some Kale parathas as a way to get Lil A to eat some of it. And guess what? It worked. He ate almost an entire parantha with some yogurt. 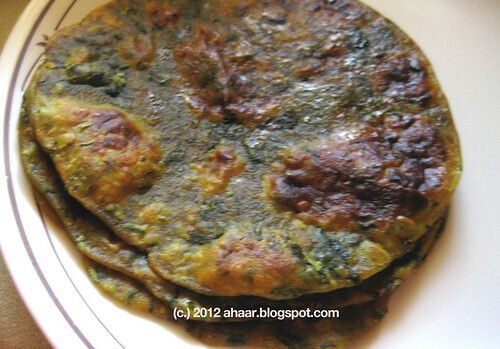 You can easily substitute kale with any other greens like spinach, or methi (fenugreek). I chopped the Kale thinly, spiced it lightly and then mixed it with the entire dough instead of stuffing. It made rolling it out easier. Wash Kale thoroughly and remove the stem or rib of kale. Chop it into thin and small pieces. Heat a pan and then add the cumin seeds. Once they start sputtering, add the grated garlic and turmeric powder. Then add the kale leaves and let it cook on closed lid for 3-4 minutes. Remove the lid and stir the Kale and add salt. Let it cook for another 2-3 minutes till the water disappears. Lay it on a plate and let it cool. Now add it to the flour and mix it well. Then make a well in the center of the flour, add water and knead it to a soft dough. Keep it aside for 30-40 minutes. Now divide the dough in equal parts and make small balls with your palm. 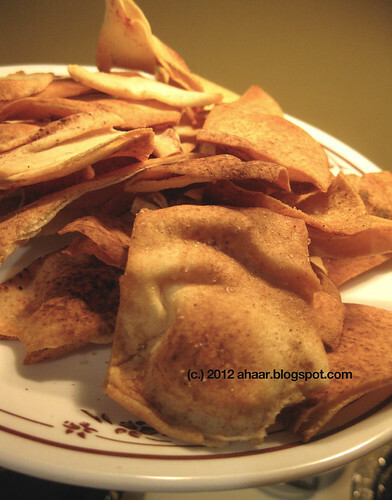 Roll them out in to small, circular parathas, use some flour dusting if it sticks, but not too much. Heat a hot griddle or pan, cook both sides with about 1/2 tspoon of oil till the brown spots appear and the paratha looks cooked. Serve hot with yogurt, pickle or even a side dish. That's right, it's been six years! And I am still here. I wouldn't be if it weren't for you and your support, encouragement and love. I've found friend, a community and have learned and grown is so many ways. Here's hoping for more in the coming days. 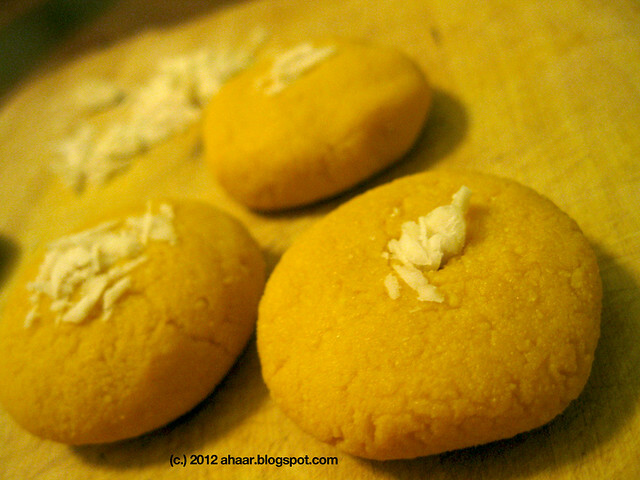 In the meantime, for this special occasion, I present Mango Sandesh or aamer shondesh! We just sort of came up with the recipe one evening as an experiment and then recruited family members and friends to try it out for us. The result was surprisingly good and a big thumbs up! So the recipe finds it's way to the blog. My parents are packing their bags to return to India, so things are going to be quieter for a few days. 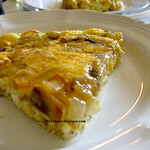 I still have their recipes in the drafts so hopefully will post them in the next coming days. 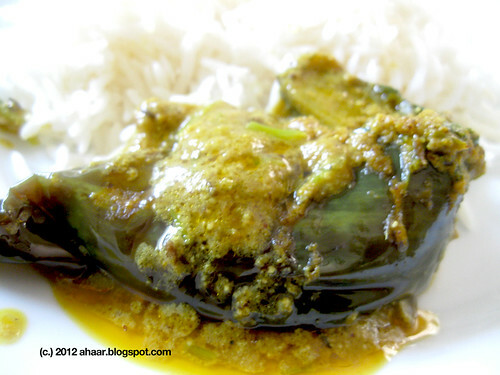 While you savor this recipe, I will go and enjoy the "ilish mach bhapano" one more time. Boil the milk and when it's boiling add the lemon till the milk curdles properly. Take it off the heat and sieve it through a cheesecloth. Tie the cloth tightly and let it hang for a couple of hours till the water is gone. Leave the chana/paneer in a bowl and let it sit in the fridge for another couple of hours. 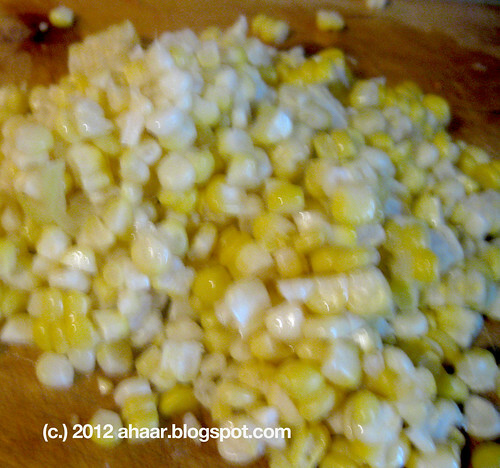 Then crumble and mash the chana/paneer till it is smooth and without lumps. From the milk I got about 1 3/4 cups of tightly packed chana/paneer. Now heat a heavy bottomed pan and put the chana/paneer in there. Then add the mango pulp. It will become a soupy mixture. Add sugar and now let it cook with constant stirring on low heat. The pulpy mix will lose all its water/liquid and come together and leave sides. Take it off the heat and give it a quick whir in a mixie. Take it out, make small round balls and add the slivered almond on top. 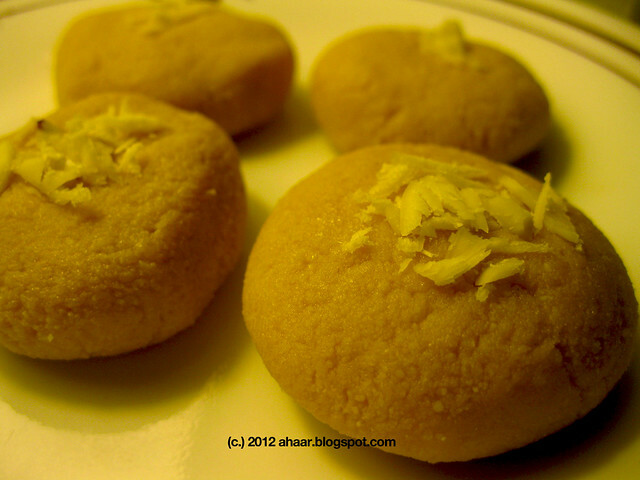 Here are my other sandesh recipes. 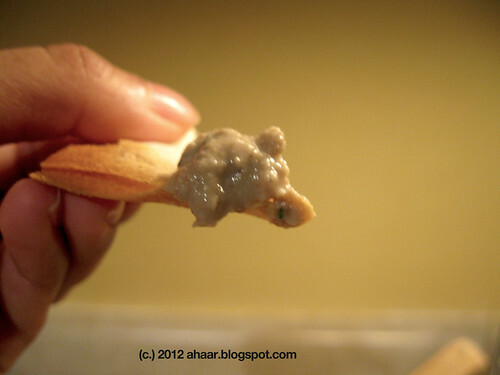 And here is eCurry's recipe for sandesh. My parents have been busy since they got here. Between them, they have take care of Lil A, taught him Bengali rhymes even "Brishti pore tapur toopur...", cleaned and tended to the garden, built the vegetable patch and cooked up a storm, some familiar and some new dishes. Thanks to my dad, my vegetable patch is growing rapidly this year and the tomatoes are almost ready. Lil A has helped a lot too keeping it watered :) He has a little watering can that he insists of taking out every evening, filling it with water and watering everything his heart desires. The plants may be the lucky ones and the bugs and ants the unlucky ones. This shorshe begun my dad made is one of the new dishes he tried here. I don't remember eating much of shorshe begun (eggplant in mustard sauce) growing up. And I am not a big fan of eggplant either. But one bite of this and I am a convert. The twist is this is a little bit of peanuts that he added in the paste. 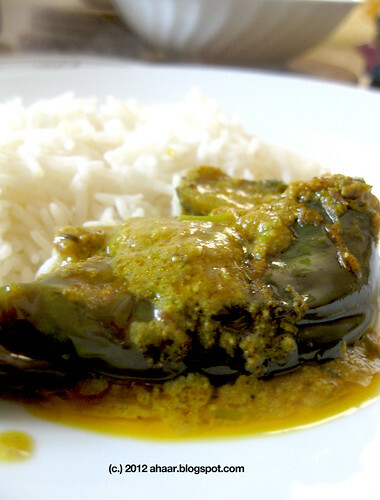 The sharpness of mustard combined with the creaminess poppy seeds and peanuts provide give the eggplants, which are cooked till they are soft, a delicious taste. Eat it with some plain rice and you'll agree as well. Put 3-4 tbspoon oil in nonstick pan, Heat the oil and shallow fry the eggplants for 2-3 minutes till they start to turn brown. Grind the paste ingredients to a fine paste and keep it aside. 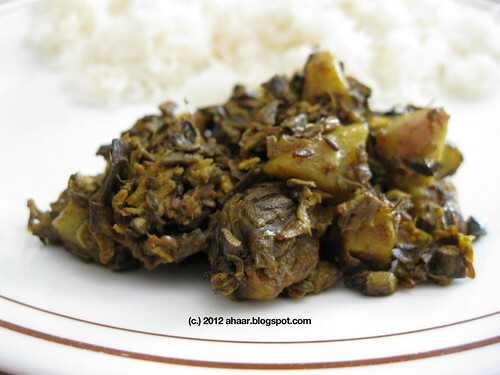 Once the eggplants are done, add in the rest of the oil and temper it with kalo jeere. Then add the asafoetida, ginger and turmeric powder. Add the eggplants and cook for 1-2 minutes. Then add the paste and let it all mix together really well. Add 3/4 cup of water, salt and let it cook on low medium heat on closed lid (about 6-7 minutes) till the eggplants are soft and the oil separates. Shorshe begun is ready to be served.